Coming off the most exciting season in recent memory, Japanese baseball is flying high — in some cases, literally so. Star pitcher Masahiro Tanaka, who signed with the New York Yankees in the offseason after leading the Rakuten Eagles to the Japan Series title, traveled to his first Big Apple press conference aboard a privately chartered JAL 787 Dreamliner. The price tag for the flight from Tokyo? A cool ¥20 million. When the 2014 season gets underway next week, fans will be hoping for a repeat of such compelling story lines. And for enthusiasts like me, the action at the concession stand promises to rival what’s happening on the field. Recent years have seen baseball teams luring fans by appealing to their stomachs, with promotions that feature regional cooking, copious amounts of booze and dishes curated by the players themselves. Leading the charge are the baseball-mad, food-loving denizens of Japan’s far north. 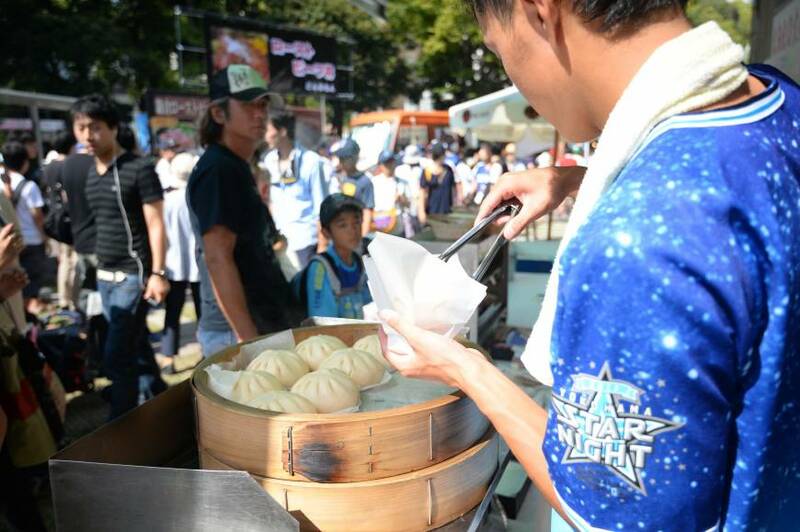 During a three-game homestand last July, the Hokkaido Nippon-Ham Fighters hosted a large-scale food fest-turned-cooking competition — just what you’d expect of a team owned by a sausage-making concern. 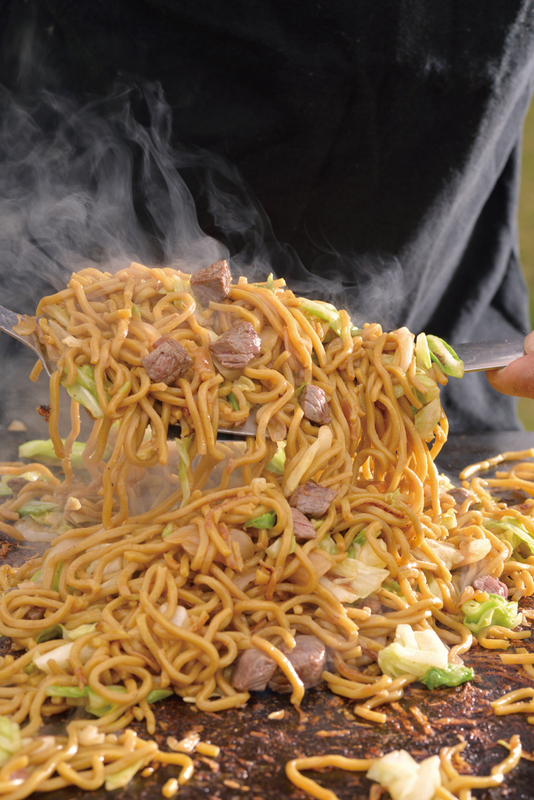 Fans voted for their favorites among 18 dishes, from noodle bowls to meat skewers, all made with locally sourced ingredients. The list of top vote-getters reads like an all-star team of Hokkaido dining: scallops with steamed rice; grilled lamb; croquettes of potato and beef; and noodles topped with spicy shrimp. Not to be outdone, the Yokohama DeNA BayStars stepped up to the plate with an event in September inspired by the boom in regional cooking known as B-kyū gurume (B-grade cuisine). If you thought Kanagawa cuisine was all about Shonan seafood and dim sum at the largest Chinatown in Japan, think again. Homegrown dishes at the festival, held on the grounds of Yokohama Stadium, included eel fried rice, Kamakura roast beef and spareribs from Ebara Foods. Chowhounds can expect more of the same in 2014. Perhaps the most intriguing promotion I’ve heard about is being run by the Tokyo Yakult Swallows. The team has partnered with rice growers in faraway Tsubame City, Niigata Prefecture, to offer onigiri made with 100-percent Koshihikari grains. 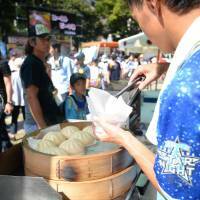 Fans at Jingu Stadium can enjoy a pair of the rice balls for ¥300. Many teams have begun connecting with supporters by asking star players to create their own bentō boxed lunches. Leading the way in these efforts — as with so many others in professional baseball — are the Yomiuri Giants. Joining a lineup that already includes bentō from rising star Hayato Sakamoto (Hamburg steak) and slugger Shinnosuke Abe (chicken nuggets), the Kyojin will unveil a boxed lunch at Tokyo Dome inspired by the team’s mascot, Giabbit. Meanwhile, down in Yokohama, ace Daisuke Miura has revamped his popular yakiniku rice-bowl bentō by adding a poached egg on top. When your team hasn’t won a title in nearly two decades, it’s probably a good idea to let fans drink their way through their sorrows. That seems to be the case with the Orix Buffaloes, whose last Nippon Professional Baseball championship came way back in 1996 (with a squad that included 22-year-old phenom Ichiro Suzuki). For the 2014 campaign, the Buffaloes are running a promotion on Fridays that lets fans at the Osaka Dome enjoy all-you-can-drink beer along with the price of a ticket. I’m not looking forward to the lines at the urinals on game day. As teams seek new ways to connect with supporters, a couple of old-school offerings are deserving of mention. The signature tempura udon bowl at Mazda Zoom-Zoom Stadium, home to the Hiroshima Toyo Carp, has been on the menu continuously since 1956. And the top-selling dish last year at the storied Koshien Stadium, which the Hanshin Tigers call home, was Koshien curry — not bad for a concession item that debuted way back in 1942. While fans may find some menu items offbeat, the basic concept at Japanese stadium eateries is the same as anywhere else: comfort food with a local twist. One conspicuous difference of ballpark dining in Japan is a lack of franchise restaurants. While team owners tie up with local restaurants on one-off promotions, it’s rare for a well-known chain to take up permanent residence. 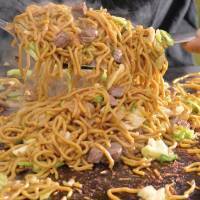 That’s not to say the food at local stadiums lacks its own distinctive character.